The Fertilisers And Chemicals TRAVANCORE limited, Udyogamandal, Is Recruiting Interested & Eligible Candidates As Paid Apprentices Under The Apprentices, So Fill Up The Online Form Within 23rd Of January, 2019. Total Number Of Vacancies →155 FACT Vacancies 2019 (Check The Images Below For More). B. Eligible Criteria For FACT Apprentice 2019. Age Limit →Should Not Exceed The Age Of 23 Year, As On 1st Of January, 2019. 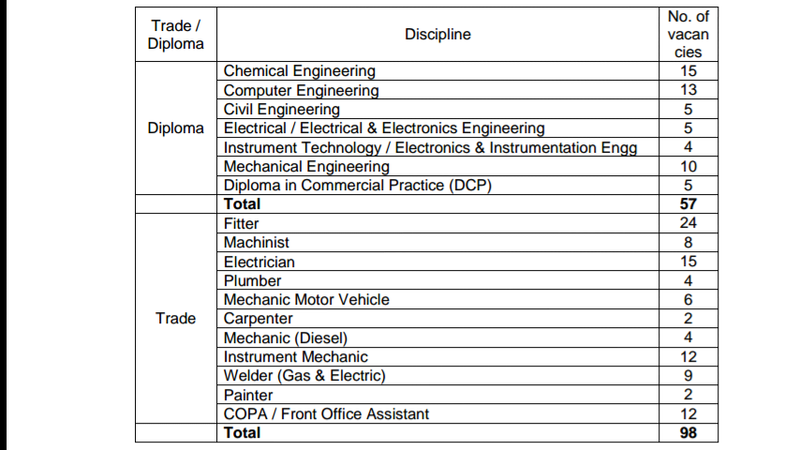 Educational Qualifications →For Trade Apprentice - ITI / ITC Trade Certificate (NTC) in Fitter, Machinist, Electrician, Plumber, Mechanic Motor Vehicle, Instrument Mechanic, Painter, Welder (Gas & Electric), Carpenter, And For Technician - A three year Diploma Engineering (under State Board of Technical Education) in Chemical, Computer, Civil, Electrical Electrical & Electronics, Electronics & Instrumentation, Instrument Technology, Mechanical, Diploma in Commercial Practice. Mode Of Examination/Selection Process →Selected On The Basis Of Marks Obtained In Academic Qualifications & Written Test. Admit Card Download →For FACT Admit Card Download, Kindly Do Check Out The Official Website Regularly, Link Is Given Below. Result→For Fact Result And Other Information, Visit There Website Here>The Official Website Of FACT. Now Apply For Fact Online Application Form & Fact Recruitment 2019 PDF, Below.